With the collagen craze spreading, its hard to pick the right company that actually produces the medicinal benefits we are searching for. This woman owned and operated business creates collagen peptides that are bioavailable, with 90% being absorbed by the body within 6 hours of intake! You will actually notice a reduction in wrinkles, increase in the strength of your hair, nails, teeth and improvement in joint health. Whatever the reason, this IS the collagen to add to your diet. Further Food’s also donates portion of their proceeds back to community member’s nonprofits. As we enter the month of the Frosty Moon, darkness and negativity can start to take form. It is important to balance our emotions and uplift our spirits from the transitioning of autumn to winter seasons. This mineral healing elixir is just what the doctor should prescribe. Formula One promotes love, romance, friendship, hope, passion, peace and compassion within us all. New obsession alert! Imagine an addicting, guilt free way to enjoy a snickerdoodle cookie, and you have visualized this Ground Up nut butter. Completely peanut, dairy and gluten free, you can indulge for hours in this blend of almonds, cashews, coconut, honey and cinnamon. We love spreading this on Erewhon Paleo Bread or dipping fresh fruits or celery from the farmers market in it. We are especially passionate about supporting this incredible company that helps women transition out of homelessness through the sale of healthy and delicious nut butters. With winter fast approaching, our team really makes self-care a priority, especially by adding the essential vitamins and minerals to keep the energy present in our bodies. That is why we use the highest quality, 100% natural and purified, direct source Shilajit Resin from Hybrid Herbs. Known as "The Destroyer Of Weakness,” Shilajit has been shown to rejuvenate the body, increase wound healing, promote healthy aging and mental clarity, and strengthen the immune system. We also love the sustainability efforts of Hybrid Herbs for packaging their products in organic violet glass, which are 100% recyclable and reusable! Our good friends over at Spruce Naturals make us smell like beautiful lavender flowers and we want our readers to as well! Natural and organic, this simple deodorant is made from coconut oil, shea butter, baking soda, and lovely blends of essential oils. Best part is we never have any under arm stains! Sometimes we all need that extra boost to relieve that extra holiday stress, anxiety and depression. This amazing tonic is filled with organic and wildcrafted herbs that will naturally increase serotonin and dopamine levels and stabilize hormone function. With a mix of adaptogens, such as Rhodiola and Ashwagandha, and St. Johns Wort, Mucuna and Albizzia, this is pure happiness in a bottle! For all the vegans and plant-based eaters out there, it is important to supplement your body with essential B-12 vitamins. This affordable and reliable blend contains two of the most bioactive forms of B-12, with 80% methylcobalamin and 20% adenosylcobalamin. Make sure to take this before indulging on that Tofurky for Thanksgiving! Luscious and luxurious, this is the essential addition to your skin care routine to combat the cold season. Perfect for all sensitive skin types, this organic eye crème will moisturize and protect your eye area from the dehydrating elements. It is deeply nourishing, using enriching herbs such as linden, wild rose, and aloe vera to a spectrum of vitamins and minerals such as Vitamin A and C complex. Who doesn’t love the season of pumpkin and chai? We are currently waking up and sipping on this anti-inflammatory and organically grown delicious blend of Black Tea, Turmeric Root, Ginger, Cardamom, Cinnamon, Clove and Black pepper. The highest quality healthy chai around! Do not fret, this London-based company sells online and in various US stores as well. Speaking of tea, there is nothing better than curling up by the fire with a good book and spot of tea. 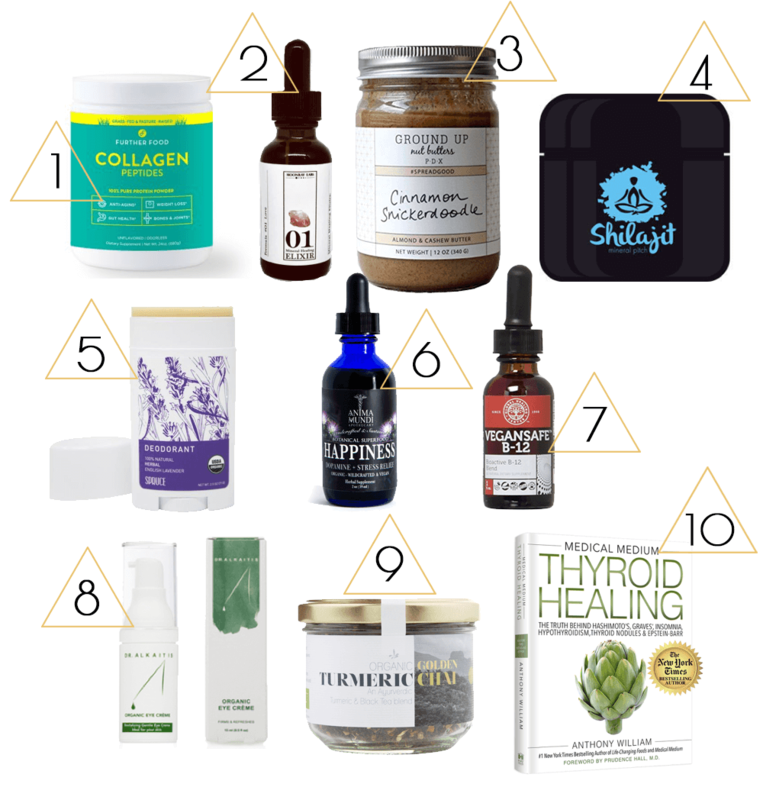 Thyroid Healing: The Truth behind Hashimoto's, Graves', Insomnia, Hypothyroidism, Thyroid Nodules & Epstein-Barr, is the follow up Anthony William’s book we have been waiting for! The incredible healer is at it again, teaching the world and sharing his knowledge about how to properly heal thyroid conditions. Essential read and great holiday gift!